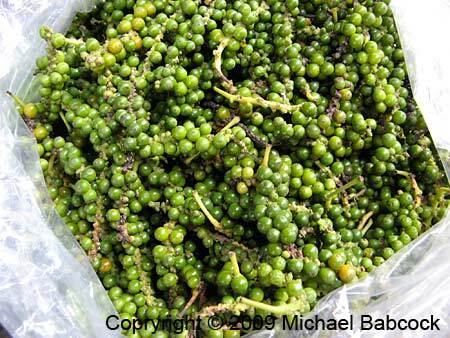 Fresh green peppercorns such as these are widely available in the markets of Thailand. These were photographed at Hua Hin market. At this stage they are soft, highly aromatic and mildly hot. If these picked peppercorns were dried, the outer shell would turn black and become black peppercorns. Kasma's recipe for Sizzling Stir-fried Squid (Bplah Meuk Pad Chah) uses fresh green peppercorns. She teaches the recipe in Advanced Series Set B (class 2).